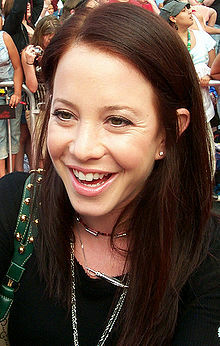 For other people named Amy Davidson, see Amy Davidson (disambiguation). Amy Davidson (born September 15, 1979) is an American actress. She is known for playing Kerry Hennessy in the ABC sitcom 8 Simple Rules. Born in Phoenix, Arizona, Davidson was raised by educators. Her father was a principal at El Mirage Elementary School, and her mother was an English teacher at Desert Foothills Junior High School. Her parents enrolled her in dance classes as a young child. She became a member of "Dance Motion". Davidson took ballet, pointe, hip-hop and modern dancing. While attending Shadow Mountain High School, she began appearing in advertisements. Her acting coach, Jean Fowler, encouraged her to move to Hollywood. After appearing in the TV movie The Truth About Jane and an episode of the drama series Judging Amy, she was cast in the Mary-Kate and Ashley Olsen series So Little Time. She guest-starred on the sitcom Malcolm in the Middle and in the Hallmark Channel film Annie's Point opposite Betty White and Richard Thomas. Other roles include the film Goyband, in which she stars as a young Orthodox Jewish girl who falls for an ex-boyband pop star (Adam Pascal) who performs at her family's hotel in the Catskills. Davidson also runs a fashion and lifestyle blog. 2001 Judging Amy Lindsey Sandowski Episode: "Look Closer"
Punk'd Herself, prank victim Episode: "Kaley Cuoco/The Rock/Julia Stiles"
Brandy & Mr. Whiskers Tiffany Turlington Episode: "One of a Kind"
2006 Strong Medicine Jamie Episode: "Baby Boom!" Malcolm in the Middle Paula Episode: "Lois Strikes Back"
2007 CSI: NY Carolyn Episode: "Past Imperfect"
2009 Criminal Minds Zoe Hawkes Episode: "Zoe's Reprise"
Ghost Whisperer Dana Mayhew Episode: "Head Over Heels"
2011 CSI: Crime Scene Investigation Leslie Gitig Episode: "Tell-Tale Hearts"
2012 House Molly Episode: "We Need the Eggs"
Bones Dr. Leona Saunders Episode: "The Corpse at the Convention"
2015 Better Call Saul Sabrina Episode: "Marco"
Hell's Kitchen Herself  Episode: "8 Chefs Compete Again"
^ "Amy Davidson Expecting First Child". People. November 2, 2015. Retrieved February 25, 2019. ^ "Amy Davidson Welcomes Son Lennox Sawyer". People. March 4, 2016. Retrieved February 25, 2019. This page is based on the Wikipedia article Amy Davidson; it is used under the Creative Commons Attribution-ShareAlike 3.0 Unported License (CC-BY-SA). You may redistribute it, verbatim or modified, providing that you comply with the terms of the CC-BY-SA.